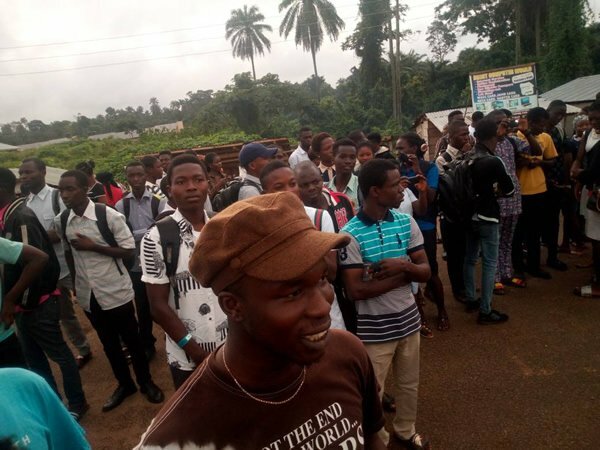 Students of the Federal University Oye-Ekiti (FUOYE), on Monday staged a peaceful protest against the institution’s directive preventing students who had not paid their school fees from sitting for the ongoing first semester examination. The students, who took to the Oye-Ikole highway, locked down the highway for hours before returning to the main gate of the institution to continue the protest. One of the protesters, who spoke with the News Agency of Nigeria (NAN) said that some students were denied access to the examination hall on May 10 inspite of the fact that the deadline for the payment of school fees had not lapsed. NAN also reports that the protest disrupted the examination. Read Also: FUOYE Examination Timetable for First Semester 2017/2018 Academic Session. But the institution’s Public Relations Officer, Mr Godfrey Badji, told NAN that some students who had not fully paid their school fees were the ones protesting. He said the institution’s management had directed that those who had not completed payment of their school fees should not sit for the examination. ‘While implementing this directive, some students who had not paid their school fees were not allowed to participate in the ongoing semester examination.